On Sunday May 2 at 6:00pm, the Conference opens with a reception in the splendor of the historic Crystal Ballroom. Tapas and a selection of drinks will be provided and a cash bar will be available. New Conference attendees are invited to arrive at 6:00pm for the orientation session in the adjoining Palm Court. Dignitaries will be present as well. A silent benefit auction will be open from 7:00pm – 8:30pm with unique items from Canada and abroad: cultural artifacts like musical instruments, work literature such as autographed books, and play items such as getaway packages at BC resorts. Proceeds from the benefit auction will be supporting evaluation education in Canada (CESEF). Your entry to this great evening is included in your Conference registration. Join others for an early morning stretch. This will be a gentle practice to wake the body up slowly, and is suitable for all levels. Rhonda will provide mats and stretching straps for the practice. Please wear loose comfortable clothing. West Coast Welcome 6:15 p.m. to 9:00 p.m. The British Columbia Chapter of the Canadian Evaluation Society together with our sponsor Johnston Research Inc., are proud to welcome conference delegates to Victoria and the West Coast. We invite you to join us for a unique evening of food and First Nations entertainment at the First Peoples Gallery in the Royal BC Museum; just 2 blocks from the Conference Centre. This outstanding gallery includes ceremonial masks, carvings, a long house, and interactive displays that provide visitors with dramatic glimpses of First Nations cultures before and after the arrival of Europeans. Our evening begins at 6:15 pm when the Museum opens for our event. As guests arrive and ascend to the First Peoples Gallery on the third floor, we will experience a drumming ceremonial welcome followed at 6:45 by an official welcome from Bob Baker of the Squamish Nation. Bob is a cultural advisor and performer who has been exercising his Squamish culture through singing, dances and various presentations in Canada and other countries for over 35 years. His on-going performances and projects continue throughout the Lower Mainland, Squamish-Whistler, and Vancouver Island. A highlight of the evening will be two performances by the Le-La-La Dancers, a well known traditional First Nations dance troupe whose members are from the Kwakwaka'wakw Nation of northern Vancouver Island. The Le-La-la Dancers have been sharing their culture around the world for 20 years. 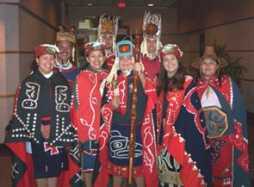 The history, traditions and customs of the Kwakwaka'wakw peoples go back over ten thousand years. The family right to perform these ceremonial dances have been passed down from generation to generation. Members of the company come from families with chiefly traditions and have inherited the rights to perform the ceremonial and sacred dances of their ancestors. The feature presentation, Spirit of the Masks, is a live narrated demonstration of traditional songs and dances. Messages of respect and honour for each other as well as toward Mother Earth are expressed throughout the performance. Through vibrant regalia, exquisitely carved cedar masks and traditional drumming, ancient legends of animals and spirits come to life. The Le-La-La Dancers perform at many resorts, hotels, museums and public festivals while introducing and enthralling audiences who are unfamiliar with their Kwakwaka'wakw culture. Prepare to be captivated. This special evening offers an opportunity to experience two performances by the Le-La-La Dancers, enjoy the exhibits of the First Peoples Gallery, and simply mingle and eat. Please register for this event on-line at the Conference Web site. The cost per guest is $57 plus GST. Our capacity is limited to 200 guests, so the tickets won't last long. Sign up early. Join others for an early morning stretch. This practice will be a slow flowing practice to wake the body up and provide warmth and stretch to the muscles, especially helping to release the back and lower body (helpful after sitting for a few days!). This is an all levels practice, and Rhonda will offer modifications or ways to challenge the body for those who are familiar with a yoga practice. Rhonda will provide mats for the practice. Please wear loose comfortable clothing. Ocean Cruise Wine & Cheese Event 6:30 p.m. to 10:30 p.m.
As this year marks the 25th anniversary of R.A. Malatest & Associates Ltd., we are proud to sponsor a special event to herald the 2010 Canadian Evaluation Society Conference. In the spirit of celebration, Malatest welcomes you to join us on the Victoria Queen of Diamonds ocean cruiser for a selection of BC wines, ales, cheeses and appetizers. For approximately 2 ½ hours, this cruise will tour the Greater Victoria Inner Harbour and coastline of Vancouver Island. Look forward to seeing the famous Fairmont Empress Hotel, BC Parliament Buildings lit up at night and the beautiful Victoria harbour community. Should any whales, harbour seals or sea lions be sighted within the vicinity during our cruise, the captain will be sure to point them out! Passengers are asked to join us at the Lower Causeway of the Victoria Inner Harbour (down in front of the Empress Hotel – more detailed dock information to be made available in your registration package) between 6:30 p.m. and 7:00 p.m. for our 7:15 p.m. sailing. The Victoria Queen of Diamonds is equipped with a large outdoor viewing deck, two levels of spacious indoor cabin area, full washroom facilities and plenty of seating. 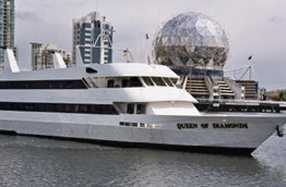 This fabulous vessel sets the gold standard for ocean cruises in the BC coastal area. R.A. Malatest & Associates Ltd. and VancouverCruises.com hope to provide you with a wonderful evening onboard. Your ticket will include your passage, two beverage coupons valid for the available BC wine and beer choices, and for the fine selection of appetizers and cheeses. Tea, coffee and other non-alcoholic beverages are included in your boarding pass. Additional alcoholic beverages will be priced from $5.00 and up. Delicious items will be available for sale in addition to the sumptuous offerings provided by local cheese artisans and chocolatiers – these will be hard to pass up! There will be live instrumental music for your further enjoyment. Please join us for this special event! A tour of Victoria's inner harbour and coastline while onboard the Victoria Queen of Diamonds is a genuinely wonderful experience. To register for this event, please select the Boat Cruise – Tuesday, May 4, 2010. The cost per guest is just $25.00, including GST. Sign up now – only 200 seats available! 8:00pm - 11:00pm (More details coming soon!) Oak Bay and Saanich Rooms. Hosted by Harry Cummings and Associates, SQÉP Chapter, and others. This workout will be an intermediate workout -suitable for those already participating in some form of physical activity. Meet and warm up inside, warm up run to Beacon Hill Park, workout in the park (rain or shine). Experience our little piece of paradise in the middle of the city. Rhonda's workouts are fun, include whole body strengthening, and for this particular workout - no equipment is necessary; just healthy knees and shoulders! Join us for this workout where you can work at your own level within the group. Modifications of exercises will be offered. Please bring water and wear supportive runners for the workout. All sessions $12/class including g.s.t. Sign up for 1 or all 3! Cost is $11/class including g.st. if you sign up for all three sessions. Sign up sheet available at the registration desk. Indoor classes capped at 24 participants, so sign up early. Payment by cash or cheque at the time of the session. Please visit Rhonda's website at www.findingthebalance.ca to read more about her classes and approach, or feel free to email her with any questions. Rhonda is a trained Yoga Instructor, Personal Trainer and is a Thai Yoga Massage Practitioner.